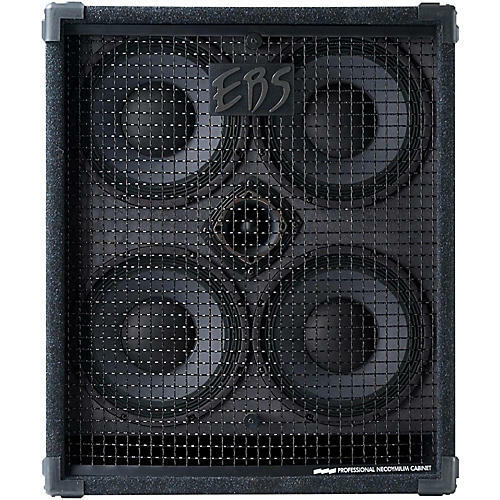 The EBS Neo 4x10 bass cab is composed of a 13-ply Baltic birch cabinet, woven steel grill with Neutrik Speakon connectors, lightweight Neodymium speakers and adjustable 2" tweeter. Made in Sweden. Dimensions: 27" x 23" x 17"
EBS gives a two year limited warranty on all electronic products and cabinets. Warranty becomes void if the serial number is defaced or has been removed, where applicable, or the product has been damaged by alteration, misuse, accident or neglect, or the product has been serviced by persons not authorized by EBS. The company assumes no liability for property damage of any sort, which may result from the failure of the product. The warranty does not cover any freight damages or damages caused by improper packing or poor packing material. Defective parts will be repaired or replaced without charge if the product is returned to an authorized EBS dealer or service center. Transportation costs to service centers are not included in the warranty. EBS will take charge of standard return shipping in case of warranty service. Extra freight charges such as express services are not included in warranty. Upon warranty claim and return of product, a copy of the original sales receipt must be enclosed, and the EBS Warranty Service Request Form must be properly filled in. The absence of these documents sets aside the warranty. Whenever a non authorized service center is to perform a warranty service on a product, permission from EBS, is required prior to actions. Any service performed by any other than an authorized EBS dealer or service center is not reimbursable under the warranty without written consent from EBS Sweden AB.